We had a zoo-lab help us design this product. Starting with calcium, we added every vitamin & mineral they are known to need, and then a natural sweetener, so they like it. Aprox. 1 yr supply, 3 oz container. In addition to their dry food and fresh fruits and veggies, Gliders have to have additional calcium. They need a complete balance of vitamins and minerals, but the calcium is essential. Gliders without a consistent source of additional calcium will eventually become paralyzed in the rear legs and tail (a condition called Tetany). This is a serious situation that can sometimes be reversed, but not always. 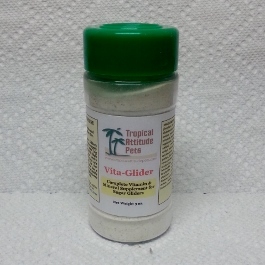 Since gliders do not like the calcium products available for reptiles, we at Tropical Attitude Pets, along with a zoo lab that designs diets and vitamins for zoos all over the world, formulated an all purpose vitamin and mineral supplement over 15 years ago. This product is called Vita Glider. 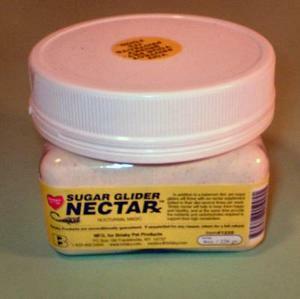 It starts with plenty of Calcium, has every vitamin and mineral they are known to need, and in the right quantities, and it has a safe sweetener added to make the product very desirable to the Sugar Gliders. This supplement is supplied in a shaker bottle. Shake a covering on their apples or other fruits and vegetables every other night when feeding. I compare how much to give them to the sugar and spice you might put on an apple pie. Not thick, but lightly covering the surface. This 3 oz bottle will last 1 ro 2 gliders a year easily. If there is some left at the end of the year, please discard it and get a new bottle. It does have a shelf life of about a year for best quality.